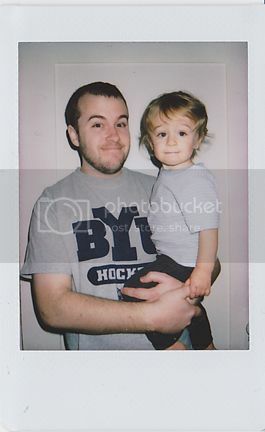 I was testing out my Instax camera and taking pictures of things I love - naturally I turned to my hubby and baby. I love how they're making the same face! Same flat smile with upturned edges and eyebrows raised to the ceiling. ha, too ridiculous! i love it! Fox's hair is SOO long! and very jealous that you have an instax camera!! They look sooo cute together! Ha! I love my Instax too...got my daughter one too so we galavant around me with my white one and her with her pink one taking little pictures. we must think alike! my photo on instragram from Sunday was "Like father like son" and it was going to be my blog post today... guess it'll have to wait. HEHE. They are so cute with the same smirk! SO cute ;) how do they pick up our mannerisms at such a young age!